Go Ahead. Admit It Was Lava. I so did this. 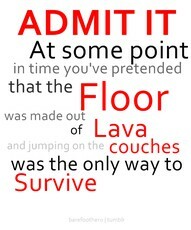 What is funny is that I remember the genuine panic I would feel if slipped off the couch and into the lava. Thankfully I never died from the lava. My friends and I would say "Oh, you landed on a log! Hurry get on the couch before the log sinks." Or if it wasn't a log it would be a bird who swooped under me. Amazingly I never died from lava burns. There was always some fantastic escape from the fiery doom. Which is fortunate because I fell off the couches a lot during these games. Now I have my own kids & we play these games together. The huge alligator is coming or we are firemen. I had forgotten what a beautiful thing it is to pretend. Even at 30 it is fun to perform surgery or play restaurant. Imagination. There is something hopeful about it. Something that reminds me some future possibilities are playful and fun. There is wonder not anxiety. Most importantly, it reminds me that even if my endeavors fail - I will be okay. If the pirates do get me when I go back for food on the island, then I will surely find a way out. And what an adventure that will be. I need to imagine more. Perhaps imagination is only intelligence having fun.